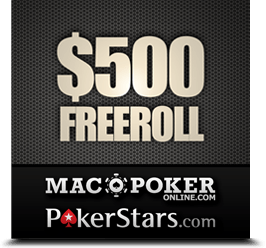 On January 15, Mac Poker Online will be hosting another $500 freeroll. The second of three $500 freerolls gets the cards on the air this Saturday at 3 p.m. ET. The freeroll hosted by PokerStars and is a private event for Mac Poker Online players. Eligible players will have earned 100 Frequent Player Points (FPP) in the previous month on PokerStars. Those who qualify will be emailed and freeroll ticket a few days prior to kick off, so be checking your inbox. The same requirements will be applied to our third $500 freeroll of the series, which is scheduled for Sat., Feb 12, on PokerStars. For those who already signed up for PokerStars through MacPokerOnline.com, be checking your email for the invite and work on getting those monthly FPPs locked up for next month’s freeroll. If haven’t signed up for a PokerStars account yet, download it now and spend the next month earning points for our Feb. 12 freeroll. Don’t forget to enter the code “MPONLINE” to earn a 100% first deposit bonus up to $600. See you at the tables and get your hands on the free cash.